One of the things which I struggle with in street photography is intrusion of privacy. Is it really OK to lift that camera and snap at whoever we want no matter what they are doing? When does it overstep the mark? On my recent trip to Asia, I spent hours shooting on the street. Most of the time I tried to be inconspicuous and discreet, but there were times when I stepped in close to get that shot. Those times my heart would quicken, but I had promised myself to be brave in pursuit of that shot. And you know, it paid off. I got some shots that I would never have gotten before. But in doing so I cannot help but feel that I overstepped the mark, that I intruded. However, in truth, there was only one occasion that a guy got a little upset with me and that in turn provided me with a great story I will write about here in the future. The shots here are an example of street photography that I am a little uncomfortable with. In shooting street, it is easy to see everyone has a potential subject; everyone as game. But are they? Are there times when people in public situations are entitled to privacy. I tend to draw the line when it comes to children, homeless people or those who are evidently in distress. But everyone else? I think my instinct is to lift the camera and shoot. On the recent trip, I encountered many people asleep in public places. Asleep they reveal so much. A tenderness and honesty is visible. The stress of the day rises and calms in their faces and for a few stolen moments they are freed. I have written before about how life in Asia is hard. People work long hours and spend ages commuting to and from work. Falling asleep in public is commonplace and accepted. Sitting opposite someone and observing them wake on train or bus is a beautiful thing. It takes the briefest of seconds for them to reacquaint themselves with their surroundings as they leave the refuge of sleep and return to the mundane reality of life. Watching them wake, I would often wait until our eyes met and greet them with a smile. Sometimes they would nod and smile in return and then we both would look away and the journey would continue. Looking back at the images I shot of people asleep I can recall such encounters. Little stories shared. I never got the chance to show someone images of them asleep. I do not think they would like or appreciate it. I know I wouldn’t. Many months ago I was struck by Eric Kim‘s claim that street photographers fear of shooting on the street stems from their own fear of having their photograph taken. I think this is a case in point. I imagine I would feel a little violated if a stranger showed me photographs of me asleep in a public setting. Yet, then why do I think it is OK to take photographs of strangers I encounter asleep? I am not sure. 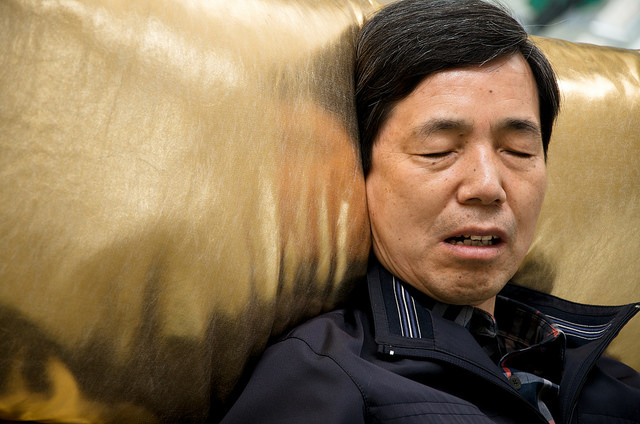 Entering the Seoul Museum of Modern Art I heard loud snores. Not having sufficient Korean to be able to comment on this to the lady in the ticket office I tried to mimic the snoring for her, but this resulted in her giving me the strangest of looks. 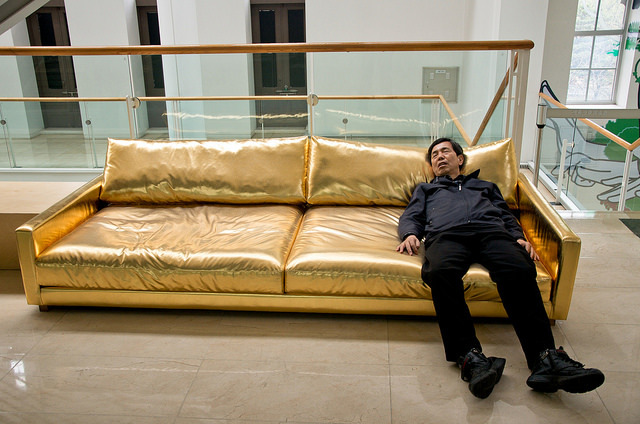 Intrigued, I followed the snores and came across the guy below stretched out on this magical, golden sofa. His snores in this cavernous museum bellowing out. For a while, I just watched him. Peaceful and oblivious. Then I hoisted up the DSLR, checked my settings and shot. Got a few with the iPhone and off I went to look at the art in the museum, all the while accompanied by the rhythm of his snoring. A quite surreal experience. On the way, I met fellow visitors and again I communicated my amusement by mimicking his snoring and together we shared a few laughs. 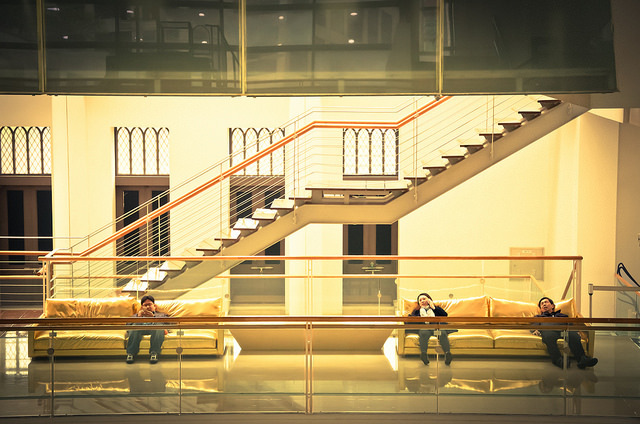 On a higher floor, I was able to get a wider shot of the guy with some people sat next to him. As I left I could still hear the snoring. I will never know if he woke. Perhaps, he was an art installation, perhaps a wax model with the sounds of a snoring man played on a loop. I do not know. But for me, he was one of many people I encountered as I travelled who were asleep in public places and who just were too good not to shoot. 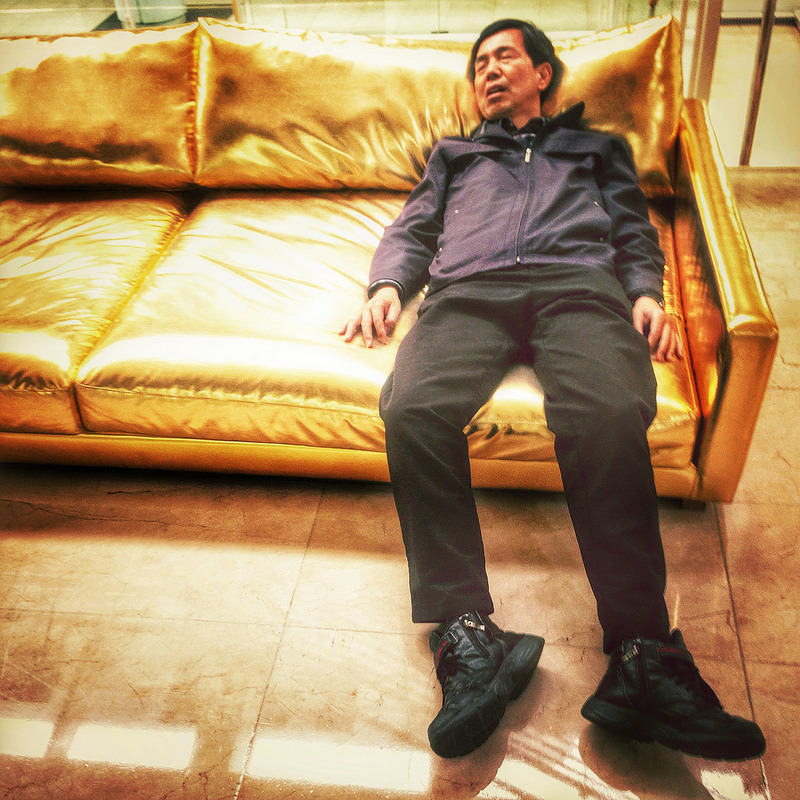 This entry was posted in photograph posts, Street Photography and tagged Asia, Brendan Ó Sé, Eric Kim, Fear and Street photography, iphoneography, Korea, photography, Seoul, Sleeping people, street photography.